Wal-Mart Is Up 12% This Month, What's Next? Customers look like they're starting to embrace the retail king once more. Photo: Flickr via Mike Mozart. 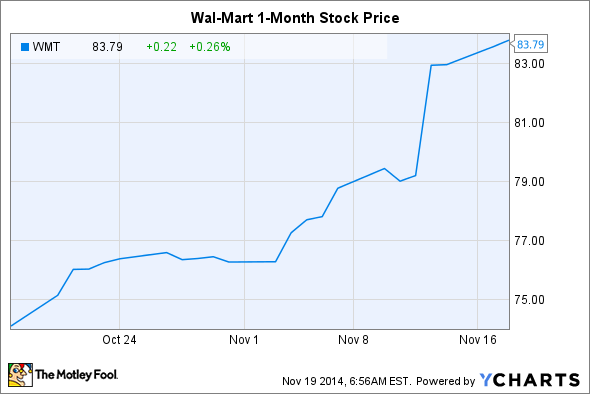 Wal-Mart (NYSE:WMT) is finally showing signs of life. After seeing sales growth stagnate and even decline over the past two years, the discount retailer finally recorded same store sales growth this past quarter, which helped fuel a near-12% gain over the past month. Now, investors want to know if Wal-Mart has figured out the formula for growth once more and can live up to its reputation as the King of Retail, or should they instead worry this is just a temporary refresher in a longer-term plateau. Even Wal-Mart couldn't outlast the challenges of a malingering economy, and after decades of superior outperformance, it succumbed to the rise of dollar store chains like Dollar General (NYSE:DG), Dollar Tree (NASDAQ:DLTR), and even Family Dollar (UNKNOWN:FDO.DL) These chains became the new go-to destination for deep discount bargains, while convenience stores carved out a niche for consumers looking to quickly grab an item or two. Wal-Mart began experimenting with smaller format stores that no longer require a shuttle bus to get from the grocery aisle to the automotive department. The Neighborhood Markets, for example, at just 42,000 square feet, are smaller versions of its 180,000-square foot supercenters, while its Walmart Express shops come in at 15,000 square feet and are closer in size to the dollar store chains. These stock just the most popular items found in its supercenters and will give consumers the grab-and-go convenience they're looking for. The other component of Wal-Mart's renaissance is its commitment to its online channel. Long recognized as a technological leader in the industry, the retailer has been snatching up small tech firms like Adchemy, Stylr, Luvocracy, and Yumprint to better engage its customers. The company continues to invest in its technology infrastructure. Wal-Mart had originally said it would spend around $800 million this fiscal year on e-commerce and digital initiatives, but during its earnings preannouncement last month, management said it would be spending an estimated $1 billion in fiscal year 2015 with an additional $1.2 billion-$1.5 billion spent in the next fiscal year. From enhancements to the online shopping experience to building out its online grocery shopping and delivery -- new distribution centers are part and parcel of its planned capital expenditures -- Wal-Mart is emphasizing the online channel as a key component of its future growth. Of course, the investments its making now and those in the immediate future will be felt in its financial performance. Wal-Mart has reported steadily falling returns on both investments and assets as a result of decreases in operating income as well as the capital investment program it laid out for store growth and e-commerce. Is Wal-Mart a long-term investment for you? For those with a short-term mind-set, Wal-Mart's sharp fall and just-as-steep rebound were opportunities for quick profits. The store of value in Wal-Mart, though, is in its long-term value proposition for shareholders. Despite lowering sales guidance for fiscal year 2015 -- an indication these performance issues won't magically vanish right away -- it has put in place the first foundations for its future recovery. Still, investors need to keep an eye on its progress. One quarter does not make a trend, and Wal-Mart still reported lower customer traffic this quarter, despite the higher comps, and profits were down year over year once again.